bordering the Pacific coast into 10 wartime communities constructed in remote areas between the Sierra Nevada Mountains and the Mississippi River. The forced movement of these people was started in the early spring of 1942. At that time, with invasion of the west coast looming as an imminent possibility, the Western Defense Command of the United States Army decided that the military situation required the removal of all persons of Japanese ancestry from a broad coastal strip. In the weeks that followed, both American-born and alien Japanese residents were moved from a prescribed zone comprising the entire State of California, the western half of Oregon and Washington, and the southern third of Arizona. From internment camps came the men who made up such Army units as the 442d Regimental Combat Team and the Allied Translators and Interpreters Service (ATIS). What was it like to go a "Relocation Camp" and then volunteer for the US Army? After you have been kicked around, rounded up like cattle, reclassified as "4C" (enemy alien) and thrown into a so-called "Relocation Camp" all without due process, how many of you would volunteer, if asked, to join the very Army guarding your "Relocation Camp" from guard towers? How many would volunteer, especially when told that you are being asked to volunteer to fight against the very country you are accused of being loyal to? In May 1941, I had just received my bachelor's degree from the University of California. On December 7th of that year — I remember vividly since it was my younger brother's birthday — it was a Sunday and we just heard Japan bombed Pearl Harbor and President Roosevelt declared war on Japan. I knew we, Japanese Americans, were going to have a hard time; we began seeing " I am Chinese", " I am Filipino", and other pins to differentiate them from us. I felt that perhaps my parents, who were unable to obtain US citizenship and therefore aliens, might by rounded up, although they were only poor farmers. 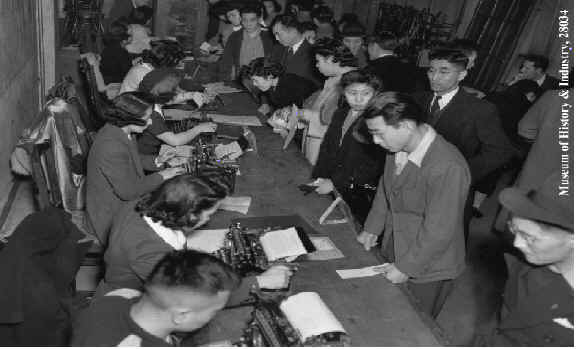 On February 19, 1942, President Roosevelt signed Executive Order 9066, giving local military commanders the authority to take whatever action they deemed necessary to insure the security of that area. Shortly thereafter, General DeWitt, military commander of the Western Defense Command, ordered the evacuation of all those with Japanese blood from the three western states, California, Oregon and Washington, although there was not one single act of espionage on the part of the Japanese Americans. This obviously was a political move augmented by his own display of an unabashed bias against all persons of Japanese ancestry. I could not believe it applied to me, an American citizen, born in the USA. There was no organized opposition to this illegal order, for we all meekly complied with this order to evacuate. My dreams were shattered. I lost all self respect, for being treated like a criminal. I remember going into town and was stopped by the father of the local sheriff for having a radio in my car. My temper flared momentarily because I could not understand why I shouldn’t be allowed to have a car radio and also because he had no authority to stop me in the first place. The sheriff stopped by my farm that afternoon and confiscated my radio saying that I could convert it into a short-wave radio to listen to instructions from Japan. We were all rounded up like cattle. I slowly began to reason that since we looked like the enemy, we must do something to prove that we remain loyal and patriotic American citizens. We spent three months in an assembly center in Turlock, California, a horserace stadium, hastily configured to accommodate the evacuees. Our family of five shared a horse stall with another family of three. We were then shipped to Gila River Relocation Center, built in the Arizona desert. I worked for the camp administration, wanting to do something to prove that I was a loyal citizen. Three months later, in November 1942, I saw a notice stating that US Army was seeking qualified Japanese linguists. I felt that I did not qualify, regretting those missed opportunity to learn the language. One of the recruiters was my college classmate and I went to see him just to say hello. He soon began testing me for my knowledge of the Japanese language. He said that I qualified and asked me if I would volunteer. I was elated and told him I would, but first I had to formally confer with my family. We had a family meeting, comprised of my parents, my younger brother, my younger sister and myself. When I asked for my parent's permission to volunteer, he said America was my country and if I wanted to fight for my country, he would give his and his family's blessing. He only asked that I do nothing to bring shame to the family. Subsequently my younger brother volunteered for the 442nd Regimental Combat Team and my sister volunteered for the US Army's nurse training course in Minnesota. I felt that I had to do something to prove that, despite the fact that my face was Japanese, I was an American at heart, a loyal American willing to die for my country. As a private in the US Army, I gained back all of my self respect; the Army especially gave back this self respect for we were selected for being of Japanese extraction and having knowledge of the Japanese language. There no longer was any shame in being a Nisei (second generation Japanese). We studied not only the Japanese language but also the Japanese military terminology. After six months of intensive grueling language training, we were sent to Camp Shelby, Mississippi for our basic training. We trained with the all Nisei 442nd Regimental Combat Team, which was later sent to the European Theater and fought with distinction; it became the most highly decorated unit for its size and length of service in the history of the US Army. We were then sent overseas to Allied Translators and Interpreters Service (ATIS), located in the suburbs of Melbourne, Australia. Many of us were then attached to every Allied combat units in the Greater Pacific areas as interpreters, interrogators, translators , radio monitors, radio broadcasters whereever Japanese linguists were needed. Our presence in the Pacific was highly classified because the enemy assumed that the Allied forces had only a very limited linguistic capability and therefore relayed instructions in the open. This enabled our linguists to obtain valuable tactical intelligence. Our contribution saved countless Allied lives and shortened the war. I was discharged from the Army in 1947 as a First Lieutenant, having obtained my field commission in Manila in 1945. As a patriot, I agreed to sign on as an "inactive reserve". In hindsight, I think we were "superpatriots", for having volunteered despite the extreme injustices inflicted on us in order to prove that were loyal and patriotic Americans and to regain our self respect as an American. We and our subsequent generations have therefore reaped the benefits of our bold action we took during WW II in volunteering to fight for our country both in the European and Pacific theaters.